For the card term, see Card sharp. The Cardsharps (painted around 1594) is a painting by the Italian Baroque artist Michelangelo Merisi da Caravaggio. The original is generally agreed to be the work acquired by the Kimbell Art Museum in 1987, although Caravaggio may have painted more than one version. The painting shows an expensively-dressed but unworldly boy playing cards with another boy. The second boy, a cardsharp, has extra cards tucked in his belt behind his back, out of sight of the mark but not the viewer, and a sinister older man is peering over the dupe's shoulder and signaling to his young accomplice. The second boy has a dagger handy at his side. It was the second such painting Caravaggio created. The first, The Fortune Teller, had drawn attention, and this painting extended his reputation, small though it was at this stage. The subjects of The Fortune Teller and Cardsharps offered something new, realistic scenes of street life, especially with this beautifully rendered attention to little details such as the split fingers on the older man's gloves, or the teenage cheat's anxious glance at his master. The psychological insight is equally striking, the three figures bound together by the common drama, yet each with his own unique part within the larger play – for if the innocent is being duped, the other boy is no older, another innocent being corrupted even as he cheats his gull. 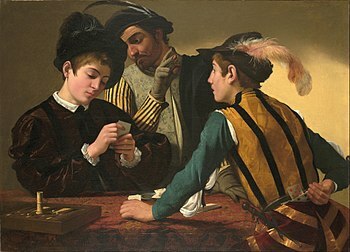 The Cardsharps, with its mixture of brutal low-life realism and luminous Venetian delicacy, was much admired, and Orsi "went around acclaiming (Caravaggio's) new style and heightening the reputation of his work." Caravaggio appears to have produced more than one version of the work (as discussed in the provenance section below). Over fifty copies and variants made by other painters have survived, with artists such as Georges de La Tour painting their own appreciations of the theme. The Cardsharp with the Ace of Diamonds by Georges de La Tour, c. 1620–1640. Whether through Costantino or Orsi, Caravaggio came to the notice of the prominent collector Cardinal Francesco Del Monte, who purchased Cardsharps and became the artist's first important patron, giving him lodgings in his Palazzo Madama behind the Piazza Navona, then as now one of the principal squares in Rome. From Del Monte's collection the work entered the collection of Cardinal Antonio Barberini, nephew of the Pope Urban VIII (whose pre-elevation portrait, Portrait of Maffeo Barberini, Caravaggio would paint in 1598), in Rome and was passed through the Colonna-Sciarra family. It eventually disappeared in the 1890s, and was rediscovered in 1987 in a private collection in Zürich; it was subsequently sold to and is currently in the collection of the Kimbell Art Museum in Fort Worth, Texas. The British art historian Denis Mahon acquired a copy of Cardsharps at auction in 2006. Although it had been sold by Sotheby's as being a copy of the work in the Kimbell Art Museum and by an artist other than Caravaggio, Mahon argued that it was a replica by Caravaggio himself. There is a pentimento, in which full detail of the face of one of the cheats had been sketched in spite of being painted over by the page's hat. This suggests that it is unlikely that it was done by a copy artist. The attribution of this version to Caravaggio has been widely accepted, although as of 2014 it is the subject of a legal dispute. This suggests that Caravaggio might have painted at least two versions of the work, as he is believed to have done with Boy Bitten by a Lizard, The Fortune Teller, and The Lute Player. Sir Denis Mahon died in 2011 and the painting had been loaned to London's Museum of the Order of St. John and insured for £10,000,000. On January 16, 2015, the High Court of England and Wales ruled in favor of Sotheby's, saying that, relying on qualified experts, Sotheby's had reasonably come to the view that the painting was not likely a Caravaggio; the judge consequently ordered the plaintiff to pay Sotheby's £1.8 million for its legal fees. ^ Note: Barberini's sister-in-law was Anna Colonna and his grand-niece married a Colonna family member also. ^ Mahon, Dennis (January 1988). "Fresh Light on Caravaggio's Earliest Period: His 'Cardsharps' Recovered". The Burlington Magazine. 130 (1018): 10–25. JSTOR 883252. ^ "Anonymous painting attributed to Caravaggio". Associated Press. 2007. Retrieved 8 June 2014. ^ "Play your cards right". Apollo. Retrieved 8 June 2014. ^ a b "Connoisseur loses legal battle over 'Caravaggio'".